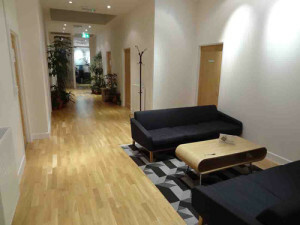 We offer osteopathy services at the Light Centre Moorgate EC2 in the city of London. Our osteopathy room is located between Moorgate, Monument and Liverpool Station on London Wall. We also offer home visit osteopathy treatment anywhere in London or in Moorgate area, whether it is at home or at your office, whenever it is convenient for you. Short notice, Saturday and Sunday sessions are available. Our osteopath in Moorgate EC2 is recognised by all major health insurances and our practice is Axa PPP recognised. Our Moorgate osteopath studied osteopathy in France and UK and specialises in back pain, neck pain and musculoskeletal conditions, as well as osteopathy for sports injuries. Our Moorgate osteopath has treated athletes and is use to treat pain related to office work as neck pain, back pain, shoulder pain and tendinitis. Our osteopath also treats migraines and can help reduce your pain efficiently. Osteopathy use different techniques to diagnose and treat medical conditions to allow the body to heal itself using its own healing mechanisms.